Currently 656 unique user posts. How do I get this?!?! I wanna have Miku sitting on my desktop like that! My OS is linux ubuntu, by the way. I've been searching all over the internet but I can't find a way to install this! 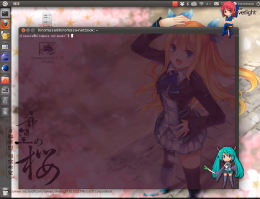 I don't run linux myself so I can't test it at the moment, but I found this which seems to have the same miku as the one in the OP screen shot. >Does it work on Linux? I really don't think downloading whatever "System Animator" is as well as the bloat that is Electron is needed for something like this. or Conky which appears to also be another (perhaps more supported) framework for writing such widgets. Nice! Can you post a screenshot of how it looks?